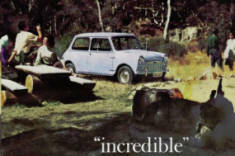 The Austin 1800 was launched in England in 1964, and in Australia about a year later in November 1965. The MKII version was released in October 1968 in Australia and carried on until November 1970. It was discontinued after the launch of the Tasman and Kimberley models. 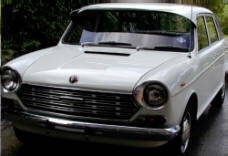 The first MKII cars had components from MKI models and have become known as MK1 1/2. 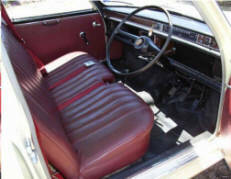 Unlike UK, and the later Tasman and Kimberley cars, all 1800 sedans were the same specification (there was no upmarket model) although one could generally choose from automatic or manual transmission, and the utilities had many items deleted as befitting its more work-related function. There are considerable differences between the MKI and MKII models although these may not be apparent to the casual driver. 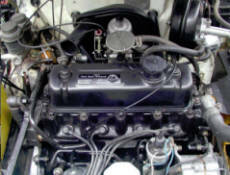 The most significant changes were an increase in power ourput via higher compression ratio and different valve sizes in the head, different second gear ratio, log type manifold, PBR dual circuit brakes, negative earth with alternator, spin-on oil filter, rocker switches for the dashboard, and centre console in the parcel tray. The original advertising theme was a carry-on from the 850 and 1100 range. 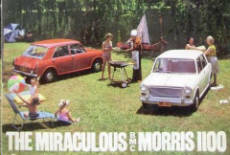 The Morris 850 was "Incredible", the 1100 was "Miraculous" and the 1800 came to be "Astounding" with an additional phrase "The Car of the Century". This was dropped in the MKII where the "Travelling First Class" theme was introduced. Despite the many modifications to suit Australian conditions, the 1800 MKI cars are typical of 60's England with Girling brakes, Lucas positive earth electrics with a generator. The MKI styling was thought to be a little ungainly with the wheels at each corner. 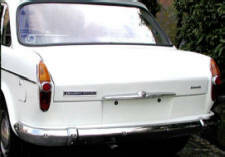 The rear had a unique cow's hips styling which were replaced by muted tailfins in the MKII. MK1 1/2 was a MKII but with older style window winders, deep parcel shelf, but rocker switches and centre console but with pull out hand brake. Girling brakes. 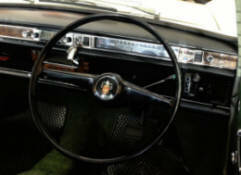 MKII had PBR dual circuit brakes, spin-on oil filter, pull up hand brake, pendant style accelerator pedal (replaces organ pedal of the MKI), different grille and indicator/parking lamps. 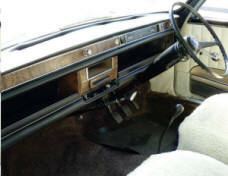 Many MKII's had a radio fitted to the centre console where it more correctly should be placed up in the wood grain strip. As a consequence, the original oddment bin for the centre console is somewhat of a rarity. Those contemplating a MKI as a donor parts car for their MKII (and vice versa) should realise that nearly none of the suspension components are common including any of the brakes. The spartan utility had plain door cards, no elbow rest, bench seat, no heater, cigar lighter, or radio, but did offer an automatic transmission as an option. The overall appearance of the utility is thought to be more balanced than the sedan and has a somewhat purposeful look. Very late MKII models had a compliance plate affixed, and had the front repeater indicator lamps mounted below the side pressing in the front guards instead of above. Interestingly, the compliance plate for a late MKII utility specifies a seating capacity of 3 and there are seat belt anchorages for a centre position. According to the regulations of the day, manufacturers had to provide a third seat belt anchorage (not the belt!) 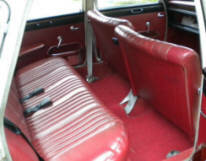 for the front if the seat had a width to accommodate three people - and the bench seat of the utility qualified. If you wanted the actual lap belt, you could buy it as an accessory. 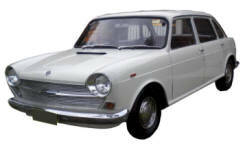 The Austin 1800 utility was designed entirely in Australia and featured a flat loading tray with very narrow wheel arch instrusions, increased capacity rear hydrolastic units, and the fitment of additional torsion bars to the rear suspension. It was released in July 1968 in MKI form with both manual and automatic transmission options and was later upgraded to MKII and continued until late 1970. Two Tasman utilities were made, one was crash tested, and the other reportedly sold privately. The final drive ratio for the manual transmission utilities was 4.75:1 compared to 4.187:1 for the sedan. For the automatic transmission, there was no difference in ratio. Unlike the sedan, where the rear suspension provides a superb ride quality, the utility is rather harsh unless there is a substantial load in the tray. Unlike the Mini and 1100, the automatic transmission in the 1800 is a 3 speed Borg Warner 35 unit adapted for front wheel drive and transverse layout. 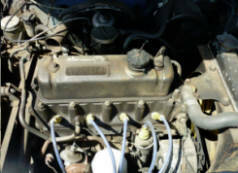 The oil for the transmission is separated from that of the engine, and a chain drive is used to transmit power from the torque converter down to the transmission input shaft. Curiously, there is no rear pump in the transmission and all pressure comes from the front pump near the torque converter - thus making the vehicle impossible to tow start. Compared to the more fragile manual transmission of the Mini and 110 range, considerable extra capacity has been built in to the 1800 transmission - perhaps more so than would have been necessary - to the advantage of the owners. As well, the clutch arrangement was a familiar outboard design which meant that the drop gear had to be placed outboard of the clutch. The disadvantage being that the whole power unit has to be removed for a clutch replacement whereas it can be done in situ with the smaller BMC models. 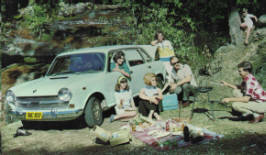 "Haven't seen one of them for years"
"I used to have one of those"
"That was my first car"
"Can't help you there mate"
BMC advertising placed a heavy emphasis on the place of the car in sunny outdoor family picnics. The Mini was never referred to as such initially, and the more formal Morris 850 was the official name of the car. 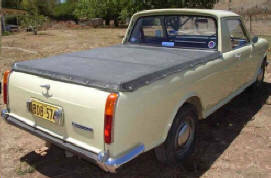 Unlike other manufacturers who labelled their cars with emotive names (like "Falcon", or "Pacer"), BMC Australia was somewhat patchy in this respect in going eventually with "Mini" and then "Kimberley", "Tasman" and "Marina" but then staying with "P76" for perhaps what was to be their most important car. (estimated from service bulletin information and likely to be low by about 200 vehicles).